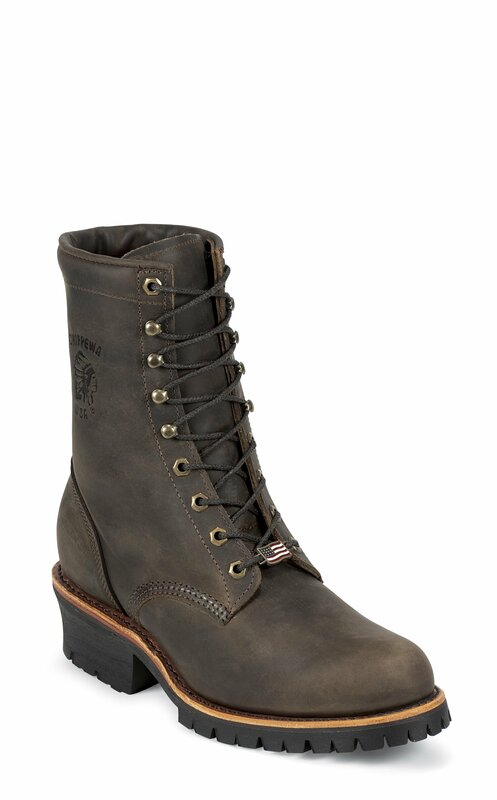 The Cibola Logger 8 an 8-inch tall men's boot is an easy go-to boot for any day of the week. The chocolate brown leather exterior is slightly distressed giving this boot a lived-in feel and features antique brass non-tarnishable hooks and eyelets for the durable waxed laces. It has 5 Iron Texon® insoles that allow for a comfortable and flexible fit and the Vibram® outsole provides maximum traction on wet or dry surfaces and various terrain. Made in the USA with global parts. I have worn Chippewa boots for decades, slip-ons for casual, packers for work. The leather is thicker and better than any other brand (and I have worn many). But the break-in was very uncomfortable. As I got older, my feet seemed to spread and the packers were starting to hurt my toes. The manager at the local store suggested a round toe. These boots were comfortable the first day I wore them. Definitely hotter than others because of the padded tongue. But well worth it due to comfort. Great ankle support. Great arch support. Excellent traction. I bought my last pair, Apache 8" pull on, in 2004 and the outer sole finally let go. Rather it wore down smooth. Aside from that, the entire boot is still intact and still as comfortable to wear as when new. Five Iron insoles are the only way to go. And I only wear boots, so that says a lot about their quality. Any how, I just replaced them two weeks ago with loggers and the Five Iron insole. Like walking on pillows! And that I do. In a warehouse walking the cement floor for ten hours a day, five days a week. Outstanding boots! So to answer any doubters? Yes. Buy yourself a pair of Chippewa's! I've always had problems finding boots that fit with out buying custom made that cost $500 but Chippewa Boots fit great , their American Made and cost alot less than custom made. Very happy with my Loggers I've had several pairs throughout the years they've never let me down!! Probably the most comfortable boots I've ever bought. They are very light and are even comfy climbing poles in. They seem too be well made and are holding up to mud water oil and snow. I'm definetly gonna stick with Chippewa.